shreddedadmin | Rubber Safe Playgrounds Inc.
For new parents, there are many milestones that are so exciting but many of those milestones are overwhelming too. 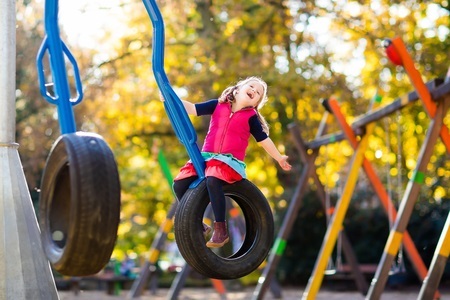 If you are considering taking your child to the playground for the first time, it is important to be prepared for the trip. The amount of supervision and hovering that you should do at the playground depends on the age of your child. A three or four year old child will need you to tail them around the jungle gym, especially if they tend to be adventurous. Some older children can handle themselves, and they are able to play and interact with the other kids without getting too involved. It is up to you to decide how much supervision your child needs, but all ages require attention. You should make that your child is safe while allowing them to build confidence by discovering the playground independently to some extent. Even if your child is a bit too young to completely understand, it’s important to establish ground rules when you’re introducing the playground to your child. Talk with them about how they should interact with other kids, things that might be off limits to them, practicing parking lot safety, and so forth. Make sure you enforce the rules when you arrive as well so they understand how to play safely. Although you’re going to the playground to play, it’s important to bring some things with you in case you need them. You should bring a change of clothes, some blankets, a few waters, and most of all, a first aid kit. In the event that your child ends up with scraped knees, you’ll want something to clean them up before you get home! When you’re choosing a playground to take your children to for the first time, you should choose a playground that uses rubber mulch instead of wood chips. Rubber mulch is safer for children, helping to protect them against falls and cuts and is much cleaner when compared to other playground bases. Here at Rubber Safe Playgrounds LLC we supply our customers with one-of-a-kind rubber mulch which is easy to maintain, durable and will provide the necessary cushion for your children on the playground.